Playing games is something I really do enjoy doing on a night in, a rainy day, or for a celebration such as Christmas. 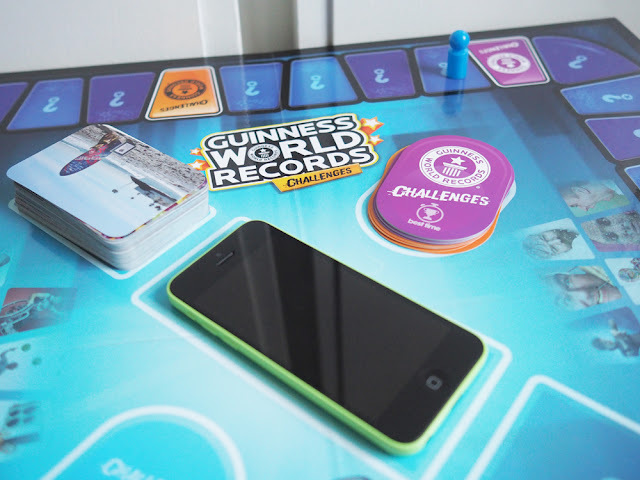 So when I got offered the chance to try the new Guinness World Records Challenges Game I was happy to give it a go! The idea of playing a game where you have to do challenges is something that really appeals to me and so I was sent one to review. The game is for 2 - 5 players and recommended for ages 8 and over. Inside the box there is a board, playing pieces, a special dice, and playing cards and score board. There are also a set of instructions and a challenge manuel that explains the challenges in more detail. There are 3 types of card, orange challenges, purple challenges and question cards. You will notice on the board there is 2 spaces for the challenges, and then 2 spaces for the question cards to be split between. There is also a space in the middle for your phone to be placed. This will be used as a timer. After placing your cards down the game is nearly set up. All you have to do is choose the colour of your playing piece and place it on start. You then roll the dice, it will either land on a number or a purple or orange Guinness world record logo. If it lands on the logo then you jump straight to a challenge of that colour. The idea is that if you complete the challenge in the given amount of time you get to keep that card. To win the game you need to collect an orange card, a purple card and then one more card of either colour. If you roll the dice and land on a number, your opponent picks up a card and reads you a question. The questions are all facts about a certain world record. The number on the dice will determine which question is read and it gives you multiple choices for the answers. I didn't get many right, as they were mostly just guesses and the thing is about world records, they generally are really random facts! But is was still fun guessing. After the card has been answered it goes to the bottom of the pile and the game continues to the next person. I must admit I would of loved if there was a little more incentive to the questions, like getting points or maybe it meant you got to move more spaces. Getting a question right didn't really have a reward. The best part of the game was the challenges. They were really fun to play. 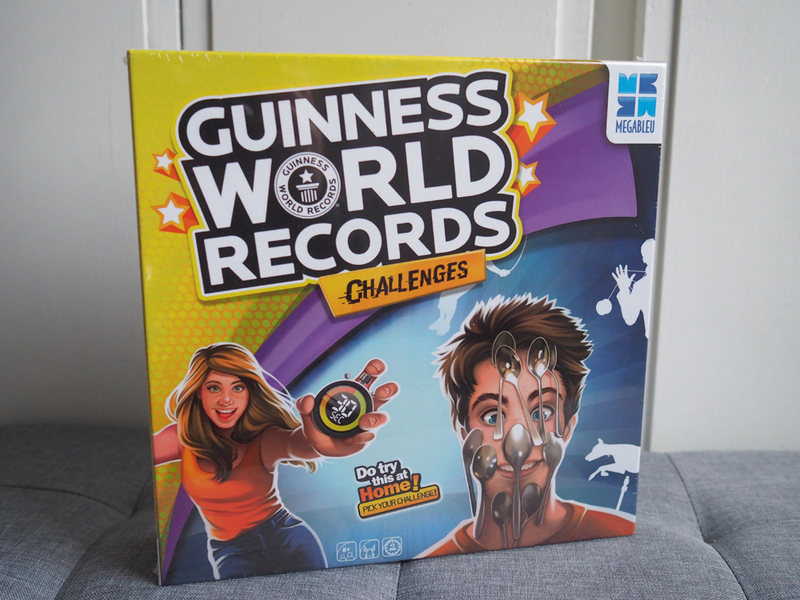 The game comes with a plastic ball for one challenge but the rest you need to provide. They are all house hold objects though like socks, and paper and paperclips and so quite easy to get hold of. I managed to find everywhere that was asked for the challenges. The ones I managed to win was hopping from Side to Side, doing star jumps really fast and piling up 25 coins. Some i found tricky and failed at though, like chucking cards into a box, flipping a coin from my elbow and catching it and spinning 10 coins. These all had to be done in a certain amount the times and sometimes I lost with seconds to spare. It was such a good giggle playing them though. There are 20 challenges in total and I do wish there was more challenges than questions in this game. I feel it would have made the game last longer and also bee more fun as I did get a little bored of answering the questions. But you can also change up the game a little and against an opponent you can do best time. This all gets recorded down onto the score pad. Over all it is a fun game and we did enjoy playing it. Would you enjoy this game? Yes! Thanks for sharing we would love this game! My daughter would love this! 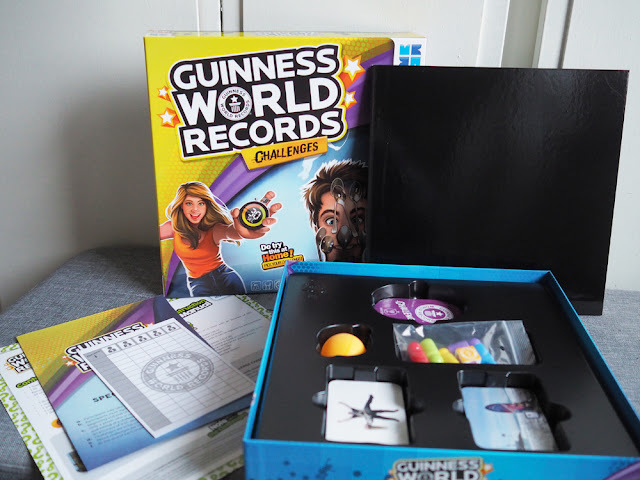 She always has the latest Guinness book of records but but didn't know there was a game and I think we as a family would love to play with this! Oh my gosh this is right up my alley!!! A candid and useful review. Thank you. Might suit one of the children.